The Los Angeles-based dance troupe that helped make Avatar comes to town. Photo courtesy of Earl Gibson. Spirit of '69: Lula Washington Dance Theatre performs "Ode to the Sixties." 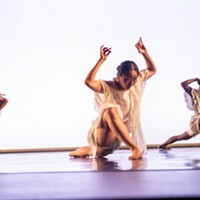 Whether inspiring South Los Angeles youth or as the models for Na'vi aliens in James Cameron's blockbuster Avatar, Lula Washington Dance Theatre has for 30 years used dance to explore social issues and the nature of humanity. Now, a decade after its previous Pittsburgh visit, the Los Angeles-based company returns on Sat., Oct. 16. 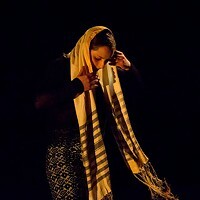 The program at Shady Side Academy's Hillman Center for the Performing Arts includes works reflecting its socially conscious outlook, African-infused movement style and high-energy approach. The two-hour program features five works, including two by artistic director/choreographer Lula Washington, beginning with "We Wore the Mask" (2006) set to traditional music arranged by Washington's son-in-law, Marcus L. Miller. "Minorities of all kinds have had to wear masks pretending to be someone they are not to fit in," says Washington, by phone from Los Angeles. "The work is about the removal of those masks and the beauty revealed underneath." Washington's other work, "Ode to the '60s" (2007), recalls the music and a time in her life -- and that of the country -- that was vibrant and transformative. The athletic group work in eight sections features music from Jimi Hendrix, The Beatles, Janis Joplin and more. The show is also a homecoming for Pittsburgh native Queala Clancy. The CAPA grad, a company member since 2009, is slated to dance in all five works on the program, including Donald McKayle's solo work "Angelitos Negros," from his 1972 masterpiece Songs of the Disinherited. Says Clancy, "The solo questions why there are no black angels depicted in church effigies and deals with issues of confidence and acceptance." Confidence in herself is something Clancy says she had to draw upon recently on tour, when she lost hold of her tennis racket while performing in Tamica Washington-Miller's "Beautiful Venus & Serena," and sent it flying into a curtain apron. "I had this moment of 'Do I continue dancing like nothing happened, do I run off stage and start crying, or do I run over and get the racket and get back in the game, so to speak?'" she says. Clancy chose the last option, finishing out the 14-minute ballet for four women that pays tribute to the tennis-star Williams sisters, whose choreography is by Washington's daughter, set to a jazz score by Miller. Washington describes the work as "a tennis match and a competition between sisters." Rounding out the program is "Reign" (2009), a work about love by the godfather of hip-hop stage dance, Rennie Harris, with music by James "JT" Wilconson. "When you go to a Lula show, it is about energy and stamina," says Clancy. "We are throwing information in your face and you are throwing energy back at us. It's this wonderful conversation that ping-pongs back and forth."